Lets face it, the miter gauge that came with your table saw is probably pretty rubbish. So you may feel the need to upgrade to something thats a bit more up to the job. Companies like INCRA specialize in producing incredibly innovative and accurate aftermarket accessories that help you get even more from your woodworking machinery. 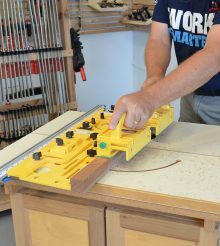 A miter gauge is a valuable accessory for not just the table saw, but can be used for a number of woodworking tools and unfortunately the miter gauge that comes with your table saw is going to be pretty basic and in some instances distinctly lacking. Now to be fair, depending on the type of woodworking that you do. the basic gauge that comes with your table saw may be perfectly adequate for your needs. 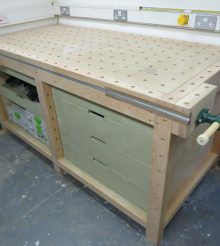 And lets face it, if table saw manufacturers were to supply the sort of miter gauges that we are talking about here, we would see it reflected in the price. So If you have found that your existing miter gauge just isn’t up to it, you may want to look at what the likes of INCRA has to offer. You can tell instantly that the INCRA Miter 1000 HD is not your usual, standard miter gauge. To start with, it looks very cool. The combination of the red, gold and silver colors as well as the detail and features of the fence tell you this is a premium product. So what exactly do you get. 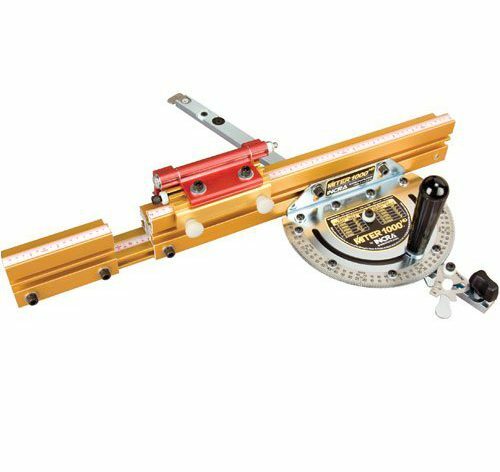 The INCRA GlideLOCK Miter Bar will fit in both a standard 3/4″ x 3/8″ square miter slot as well as the 15/16″ T miter slot. The miter bar has 6 expansion disks which adjust both sides to allow the bar to slide in the miter slot with zero play. 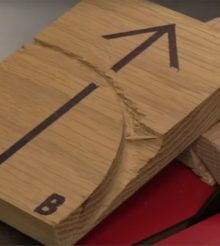 The Miter bar can accommodate miter slots between .740″ and .765″ so it would be worth checking your table saw to make sure that this will fit OK before you order. The fence of this gauge telescopes from 18″ to 31″ and features a T-slot so you can add a wooden zero clearance sub fence. It also comes with a very sophistacted length stop so you can repeat cut and be confident that every piece is exactly the same length over and over again. The stop can be set in position and it also has a fine adjuster for micro adjustments. There are two channels on the top of the fence, If you are not using a sacrificial fence you use the channel at the back. if you are using a 3.4 inch sacrificial fence you use the channel at the front which means that the Shop Stop will still work with your sacrificial fence. The fence can be mounted either side of the blade and you’ll be happy to know that INCRA have supplied two measurement tapes that can be fitted to the fence depending on which side you decide to use it.